We have another great sketch from the Diedrich gang this week. Thanks to Jack, I think, for the sketch I worked from but as it was on my iPhone I can’t show it to you. Wonder why? I like to keep my iPhone handy at all times. That includes reading emails while I soak in the tub. I know, it sounds crazy to have my beloved mini computer next to water but it has worked for over 1.5 years. Today, the baby picked it up while standing in the tub. I panicked and tried to grab it from him and I/we/he dropped it. It seems fine but we have it sitting in a container with silica just in case any water seeped in, so hopefully it will be OK. So I’m sorry but I can’t share the sketch with you. 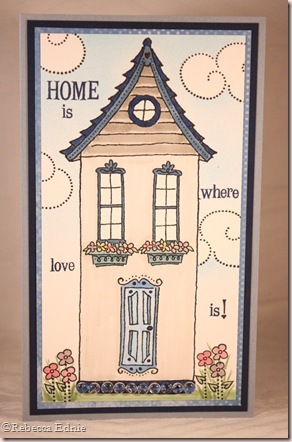 The stamps for this card are actually a set with separate door, windows, clouds etc so you can kind of design a ‘scene’. I airbrushed the background, masking my clouds as needed. The flower stems are a dotted line stamp that I think was designed to be used as smoke from the chimney. The leaves were made with a heart stamp. I coloured the scene with Copics, the colours were on my iPhone too, sorry. I’m listing the ones I can remember: W 1, 3, 5 V95 (it was V9_) R 06, 81, 83 G21, 63, BG 10 B 12, 23,32, 4_, 91, 93, best I can do! Thanks to The Character Cafe for their sponsorship this month. Visit next Wednesday to find out who the new sponsor is! Please visit the Whimsical Wednesdays blog for the sketch this week; I’m so sorry I can’t show it. I hope you will visit all of the DareDevil’s blogs; I’m sure they have FABULOUS projects to show you! Once you are done your take on the sketch, leave a DIRECT link using Mr Linky on the WW blog so the team can all see your work. Want to upload to a gallery? Please use DDSC29. WOW what beautiful card! you really have an amazing talent! This is really pretty, Rebecca! I love how you incorporated the dots at the bottom (dewdrops, I think 🙂 and that image and sentiment are equally beautiful. Awesome job! Such a cute house card Rebecca! I like that set! hi, nice card. ;-)agnes from swap-blog.nice to meet you!